The image shows two colliding galaxies known as NGC 2207 and IC 2163. It’s a false-color image, where infrared is shown as dark red, visible is shown as normal, and x-ray is shown as purple. The first impression you might have is that the image looks awfully purple, and that means there are lots of x-ray sources in these two galaxies. The reason for this is that the two galaxies are colliding. 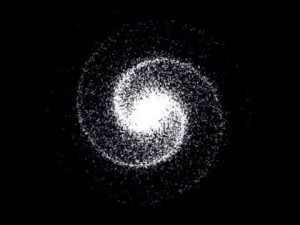 Young galaxies tend to have lots of gas and dust around to make stars, so they can produce stars at a fairly high rate, such as we see in dusty starburst galaxies. But over time the rate of stellar production goes down as the free gas and dust tends to get used up. In the Milky Way, for example, new stars form at a rate of only 1 or 2 a year. In the x-ray only image, the ULXs are clearly seen. In these galaxies that rate is about 24 solar-mass stars per year. We know this because of the high number of ultraluminous x-ray sources (ULXs), seen as bright violet dots within the image. The stars associated with these sources are only about 10 million years old, and such sources don’t stay bright for long on astronomical scales. Images such as this further support what we’ve long thought, that galaxy collisions can stir up star production in galaxies. Thanks Brian to write about our work! When I look at the pictures of NGC 2207 and IC 2163, I don’t see two colliding galaxies. I have looked at several images of these two galaxies, in different colors, including real colors, and what I clearly see is that NGC2207 in passing in front of IC2163 without ever touching it. The rightmost arm of NGS2207 is right over the core of IC2163 and it does not look disturbed at all. 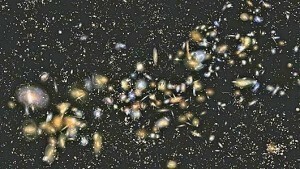 Surely it would not be the case if these galaxies were colliding.